I sit. Waiting to be called up to the front of the Club. It’s an honour. It’s scary. It’s a challenge. I’m apprehensive. I’m excited. I’m nervous. I think I feel sick, no, it’s nerves (get a grip!). My heart is pounding. It’s supposed to (if it wasn’t you’d really be in trouble)! It’s a privilege. Yes. These were thoughts and feelings going around my head on the Committee election night in June last year. … and your Shropshire Speakers incoming President is … Me! Now I know what it is – it’s an opportunity! I was given the blue ribbon presidential regalia and the pin badge and I had stepped up to lead the Club for the next year, from July 2016 to June 2017. Toastmasters is not only the place for you to improve, practice and overcome your fear of public speaking, but also to build leadership skills. But how did I get to be President? 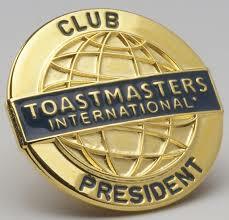 Within the Toastmaster’s year we have opportunities to enter speech competitions. At one of these club level contests I entered with a speech entitled “My Rogue Right Hand” in which I relayed how my rogue right hand had propelled me into many and varied situations by volunteering. Maybe it wasn’t a surprise that with not much prompting “my hand was up” for President. (The hand goes up and then the head thinks about the consequences a few minutes after, then it’s too late to back out). What have I done? You stepped up. That’s good. Can I do it? Of course, why shouldn’t you? Can I change my mind? If you really, really wanted to, of course, but try it first. What do I do? Ask the previous President, consult the club officer’s handbook. People will help – they don’t want you to fail. Attend club officer training. I’m not like the previous president! Of course you’re not, the previous President was a man for a start – you’re a woman! Put your own stamp on the role. Nervous – It’s a new role (perfectly normal). Not sure I can delegate – Try it and see what happens. What if I make a mistake? Think of the 99% of things that went well. Learn from the mistakes, reflect, talk it over with someone and move on. Of course, having good role models to follow was helpful and all of the Committee offered help, support and advice. If I needed anything, all I had to do was ask. So, my first club night as President arrived. What will I say as my opening line to make an impact? One year down the line, I hand the role to someone else who maybe has the same concerns I had, but now, as Immediate Past President (I have a pin for that too), I can share my experience and offer support if required. Yes, I really enjoyed it. Whatever your role at work, leadership skills are a real bonus. What did I learn whilst being President? chair committee meetings via Skype. I also learnt what a great feeling it is to help win the Presidents Distinguished Club Award for a second year running! My year as President ended by stepping into the Vice-President Education role – watch this space! 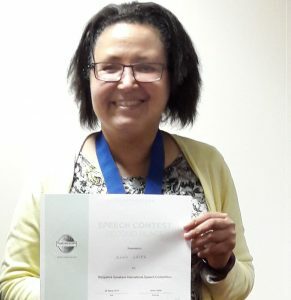 This entry was posted in Uncategorized and tagged club, club officer training, committee, DCP, leadership skills, Past President, President, Presidents Distinguished Club Award, public speaking, Shropshire speakers, Skype, toastmasters, Vice-President Education role, volunteered, volunteering. Bookmark the permalink.